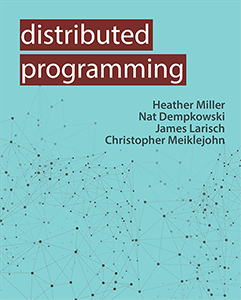 A textbook about the building blocks we use to build distributed systems. These range from the small, RPC, futures, actors, to the large; systems built up of these components like MapReduce and Spark. We explore issues and concerns central to distributed systems like consistency, availability, and fault tolerance, from the lens of the programming models and frameworks that the programmer uses to build these systems. Journal of Functional Programming, Volume 28, e7. ACM SIGPLAN Systems, Programming, Languages and Applications: Software for Humanity, Onward!